Vibration and noise levels (among many others) are some of the reasons for operator fatigue. 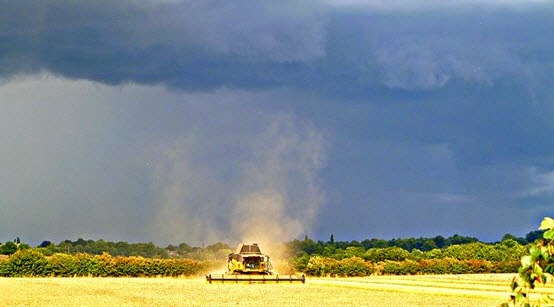 Reducing any decibels of noise in any way can be of great help for a combine operator. No too long ago, we were involved in a particular farm equipment engineering challenge – improve reliability, decrease downtime and increase the performance of a combine harvester. Across the United States (and many parts of the world), farmers battle time and weather conditions to harvest their crops at their peak maturity and moisture. With more than 70 million acres to harvest in the U.S., a reliable and continuous harvesting operation makes a big difference in both yield and profit. In the case of vine or bean crops, harvesting or combining is the most costly operation of crop production. Any adjustment to the harvesting equipment literally can make or break a farmer’s bank account because of the fluctuation of dollars per bushel harvested at its peak efficiency (or not). Improving one of the key components of a combine harvester, the mechanical reel, was the focus of the engineering challenge. The traditional U-Joint attachment that connected the drive to the gear box was a constant problem for the wind reel. A broken wind reel meant downtime for the combine harvester, which in turn translated to the loss of crop and loss of money. 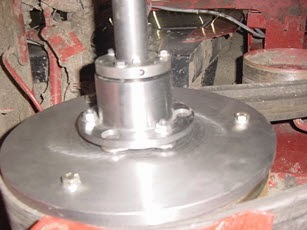 The ingenuity happened here when a SU132-6 hub and SU132-6 Disc Pack from Lovejoy, was mounted to a flange plate then bolted to an existing gear box sheave. The metal disk coupling properties, zero backlash and powerful hold, allow instant reaction to turn the shaft and instant stream flow. In other words, this disc coupling is practically maintenance free, reducing downtime. In addition, the secure hold provided by this metal coupling reduces both vibration and noise levels in the cab, to help reduce operator fatigue.